This blisteringly candid discussion of the American dilemma in the age of Trump brings together the head of the NAACP Legal Defense Fund, the former attorney general of the United States, a bestselling author and death penalty lawyer, and a star professor for an honest conversation the country desperately needs to hear. Drawing on their collective decades of work on civil rights issues as well as personal histories of rising from poverty and oppression, these leading lights of the legal profession and the fight for racial justice talk about the importance of reclaiming the racial narrative and keeping our eyes on the horizon as we work for justice in an unjust time. 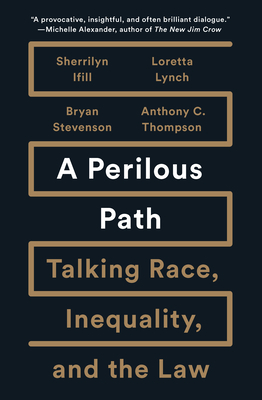 Covering topics as varied as "the commonality of pain," "when lawyers are heroes," and the concept of an "equality dividend" that is due to people of color for helping America brand itself internationally as a country of diversity and acceptance, Ifill, Lynch, Stevenson, and Thompson also explore topics such as "when did 'public' become a dirty word" (hint, it has something to do with serving people of color), "you know what Jeff Sessions is going to say," and "what it means to be a civil rights lawyer in the age of Trump." Building on Stevenson's hugely successful Just Mercy, Lynch's national platform at the Justice Department, Ifill's role as one of the leading defenders of civil rights in the country, and the occasion of Thompson's launch of a new center of on race, inequality and the law at the NYU School of Law, A Perilous Path will speak loudly and clearly to everyone concerned about America's perpetual fault line.